If you read my blog regularly, you have definitely seen this quad before :) I featured this in my Project 10 Pan post as well as my first tutorial. This is one of the first E.L.F quads I picked up and one of the most popular as I've seen many reviews of Butternut on other blogs and youtube videos. 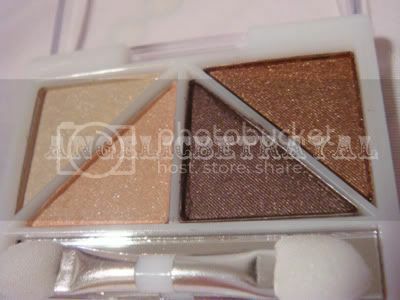 Out of all the E.L.F quads I own, this is the one I have used the most since the colors are coordinated well and they make for a foolproof look, suitable for every skintone and eye color. The two darker shades are great, especially the bronze shade which is creamy and highly pigmented. The lighter shades are lacking in the pigmentation department. 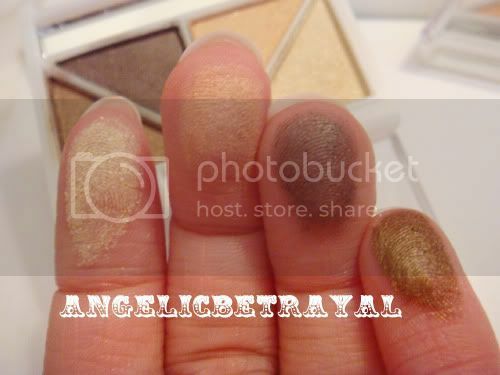 The cream color is usable over a cream base and makes a nice highlight when dusted onto the browbone. But the peach color is quite pathetic. I manage to use it sometimes to blend out the other colors in the crease. I would say the bronze color makes this quad worth the amount you pay for it though but it does leave some powder in the pan. The darkest shade is nice for defining the outer corner or crease as it's pigmentation is not overpowering yet noticeable. Although the size of the shadows seems really small, this quad will last you awhile so you get a decent amount of product for $1. I thought this eyeshadow would be easy to use up since the size seemed small compared to my other shadows but after continuous use, I've only made a small dent. If you are a beginner with makeup and want to experiment with neutrals first, I'd suggest this palette is a good buy. If you have a ton of neutral shadows then you can probably pass this up as it isn't anything amazing, but decent. I've had that quad for 2 years now and I definitely have been using it like crazy... still - it seems impossible to hit pan on that quad! I don't know why! GOOD LUCK. For me, I love all the colors except for the peach color. The bronze is gorgeous but I love the darkest shade the most. That shade reminds me of Milani's Java Bean and a bit of NYX's Root Beer.